Petition: Ban the Use of Horses in Bullfighting! Ban the Use of Horses in Bullfighting! We need to collect as many signatures as possible to flag the horrific practice of using horses in bullfighting. Horses used in bullfights are old horses, sold after serving for their whole lives. Their vocal cords are mutilated so that they can not scream in fear when the bulls approach them, or when they suffer pain. So the public does not even realize when these animals suffer. When the bullfight starts, horses are blindfolded, with Vaseline and cotton in the their ears and nostrils to deprive them of their senses. This is a whole new level of cruelty and inhumanity. Thankfully in countries where bullfighting is allowed, it is increasingly becoming recognised as sheer barbarity. This savagery involves two animals, bulls and horses. While the bulls are guaranteed to die, the future of the horses is often no brighter. These horses are often gored even though they are protected by what is termed a "peto", or a protective cape. These petos often do little more than hide the horse's wounds. These animals are used to entertain a crowd that lusts for blood and claims that bullfighting is a tradition and "cultural heritage". 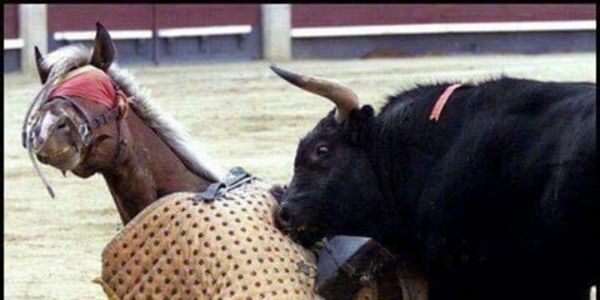 The continuation of bullfighting depends on government subsidies and the tourist industry, so please help to discourage these sadistic displays. Some of the people who have signed the petition have expressed their concerns in relation to bullfighting and the petition does not take into consideration the welfare of the bulls involved. This is not the case here and all animals are valued equally. There is a few organisation who are strongly opposed to bullfighting in general, these groups are doing a great in looking for an outright ban on this vile practice. This petition is strongly opposed to bullfighting in general, but set out to flag the lesser known aspects of this cruelty involving other animals both horses and dogs. The more pressure that can be applied on the governments of the various Countries who still condone this horrific cruelty the better. Please keep sharing the petition. Many thanks. I wish to thank you all so much for your help in highlighting the cruel practice of bullfighting. I will close the petition and take same to relevant parties and the government of the countries who still participate in the out of date cruel practice. We received a lot of signatures which illustrate how people feel about this horrible so called sport. Thank you all for taking the time to voice your concerns. Sincere thanks to you all for signing the petition. Can we please keep the momentum going by sharing on social media. Many thanks. Please keep sharing so we can acquire as many signatures as possible and expose this evil practice. Thank you all for signing the petition. Can you share this petition with family/friends and raise the awareness of this horrid activity. Thanks again. A big thank you for signing petition. As you can see from comments left everyone is horrified at this sick so called sport. Can we please keep the momentum going with regard to this petition and bring it to the attention of as many people as possible. We need to stop this vile sadistic practice. Thanks again for taking the time to sign.